Since the first volume of The Biology of Sea Turtles was published in 1997, the field has grown and matured in ways few of the authors would have predicted-particularly in the areas of physiology, behavior, genetics, and health. Volume III presents timely coverage of emerging areas as well as the integration of approaches and information that did not exist even a decade ago. The book assembles the foremost experts in each topic to provide the most up-to-date and comprehensive book on sea turtles available today.
" ... simply cannot be missing from the bookshelf of anyone seriously involved with sea turtles, whether it be sea turtle researchers or the staff and managers of marine protected areas with sea turtles in their waters or on their beaches." " ... likely to become the standard reference in the field ... well illustrated with line drawings and photographs ... a first source for many herpetologists looking for current information on sea turtles." 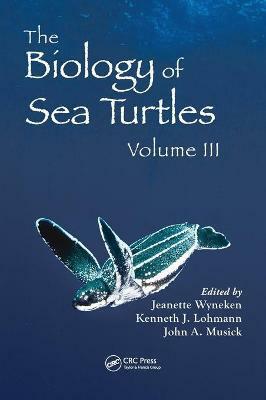 " ... undoubtedly a key reference text for those involved closely with sea turtle research and an essential purchase for institutional libraries ... ."
Kenneth J. Lohmann, Ph.D., is the Charles P. Postelle, Jr. Distinguished Professor of Biology at the University of North Carolina at Chapel Hill. His scientific interests focus on the behavior and neurobiology of marine animals, with a particular emphasis on unusual sensory systems and how animals use the Earth's magnetic field to guide long-distance migrations. He has published research on diverse invertebrate and vertebrate animals, including more than 50 peer-reviewed studies on sea turtles. John A. (Jack) Musick, Ph.D., is the Marshall Acuff Professor Emeritus in Marine Science at the Virginia Institute of Marine Science (VIMS), College of William and Mary. Many of Dr. Musick's recent studies have focused on fisheries bycatch of long-lived marine animals such as sharks and sea turtles. He has published more than 150 scientific papers and coauthored or edited 21 books focused on the ecology and conservation of sharks, marine fisheries management, and sea turtle ecology.